In medium bowl, combine graham cracker crumbs, margarine and 2 tablespoons sugar; mix well. Reserve 1/3 cup crumb mixture for garnish. Press remaining mixture in 9-inch pie pan. In small bowl, combine gelatin and boiling water; stir until dissolved. Refrigerate about 30 minutes or until slightly thickened, stirring occasionally. Meanwhile, in large bowl, beat cream cheese and 1/2 cup sugar until fluffy. Reserve 1 cup of whipped topping for garnish. Add remaining whipped topping to cream cheese mixture; stir gently to mix. Add gelatin mixture; stir gently until well blended. Pour into graham cracker crust. Refrigerate 1 hour or until set. Mound reserved whipped topping onto center of pie to resemble island. Sprinkle reserved crumb mixture on topping to resemble sand. 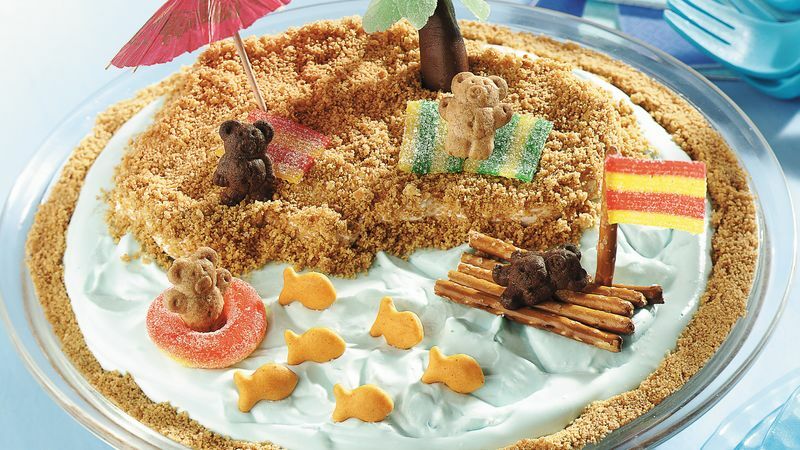 Decorate island as desired with bear-shaped graham crackers, small paper umbrellas, and other small candies or snacks.